We did it! We made it through the con and lived! This episode we present to you interviews with some great people. First we talk with Ali from a-box.com about their new subscription business and the awesome things they provide. We will be doing a giveaway for an Alien Hat as well as a tumbler! Keep your eyes pealed for that! 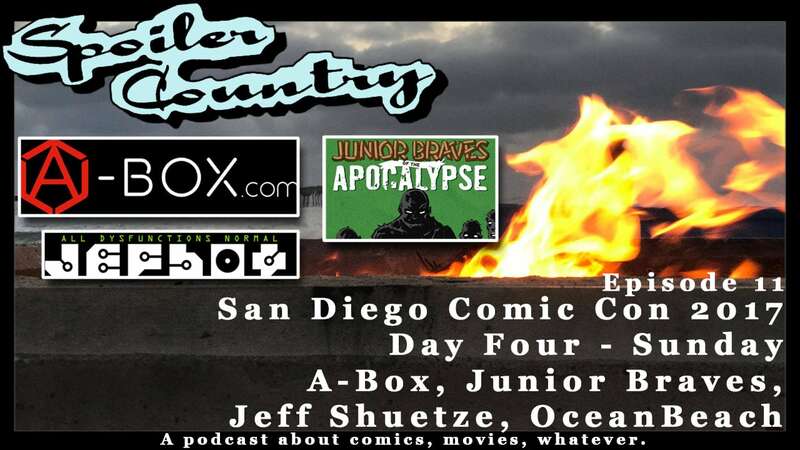 We talked with Greg Smith and Micheal Tanner who wrote Junior Braves of the Apocalypse for Oni Press. These guys are amazing, you should check out their book! We met up with an old friend of John’s Jeff Schuetze creator of JefBot to see what he’s been up to. Check out jefbot.com for more on him and be sure to follow him on instagram as well. We finished out our San Diego adventure on Ocean Beach. We are saving our interview with Mike Grell for our next episode where we will also be reviewing Green Arrow The Longbow Hunters. ← SDCC Day Three: Saturday – Stan Sakai, Kechal Comics and more!